Yule is the Wiccan Sabbat of the Winter Solstice. The Winter Solstice is the turning point of the Earth's journey "away" from the Sun. Most years, this date falls on December 21 (June 21, Southern). On this date, the nights are at their longest, and the days are as short as they will get. From here on in, the Light begins returning. It's easy to see how this is a perfect metaphor for the birth of Christ and other saviours known throughout history as the "Light of the World," and the "Light and Life." This is why Christmas Eve is celebrated on the magickal third day after the Winter Solstice. This metaphor deepens as we discover the essence of Yule: the Journey to the Heart. Yule is a rebirth. Not a flashy, fireworks-type rebirth. It's the quiet kind, an inner shift. It's that shift where the Earth chooses to look toward the Light . . . and looking, begins to move there. Yet we celebrate this deep holy day with all the flash and glitz and bling we can manage! What's up with that? All the "fireworks" we pile onto the Yule season is an unconscious salute to the transformative POWER of this shift. We may not be clear on what is really happening. But we can feel intuitively that it is potent and incredibly significant. What is the shift that happens to us at this time of year? In the Solstice season, we turn from matters of the head to matters of the heart. This is comparable to the moment when we decide that we've wallowed in the muck of our emotions and ego long enough, and it's time to focus on something clearer. Returning to spiritual values, etc. All of these demonstrate the triumph of love and compassion over clear-headed rationality. By Winter Solstice, we have travelled fully into the inner realm. We have arrived at the altar of our own Heart. We demonstrate this re-connection by offering gifts to and feasting with those we love, and by offering cheer and blessings even to those we don't know ... in token that our love is truly from the Heart, and unconditional. So it is at this time that we are closest to the Star Goddess -- the Feminine Principle of soul. The Tide of Love is at its peak. The return of the Goddess is fed through our love and joyful celebration. Either way, it's an internal shift, and like an embryo settling into the womb, not much evidence shows on the outside . . . yet. Nonetheless, it is a Fundamental Transformation. This is the key to future growth. Without this shift in focus/consciousness/awareness, we would keep spiraling into the depths of ignorance, suffering, and death. This is the same process as the Earth is calling forth in all of us... The moment when we can decide to be part of the healing rather than the disease. First shifting focus. Then acting on it. We can turn the world around. 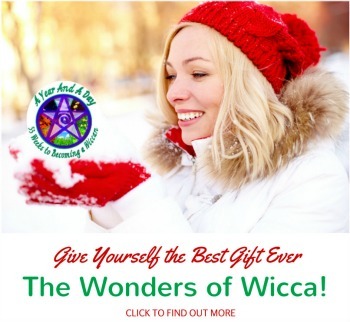 What better Yule gift for our Mother Earth? Where do you go from here? Why, pouring forth from the tide of Love. Bringing the Goddess, the soul, the Heart into the world through your everyday life. Sharing the love, the compassion for all your Mother's children through your actions in the world... and the feelings you allow in your heart. This begins its full manifestation at the next Wiccan Sabbat: Bridgid (Imbolc).